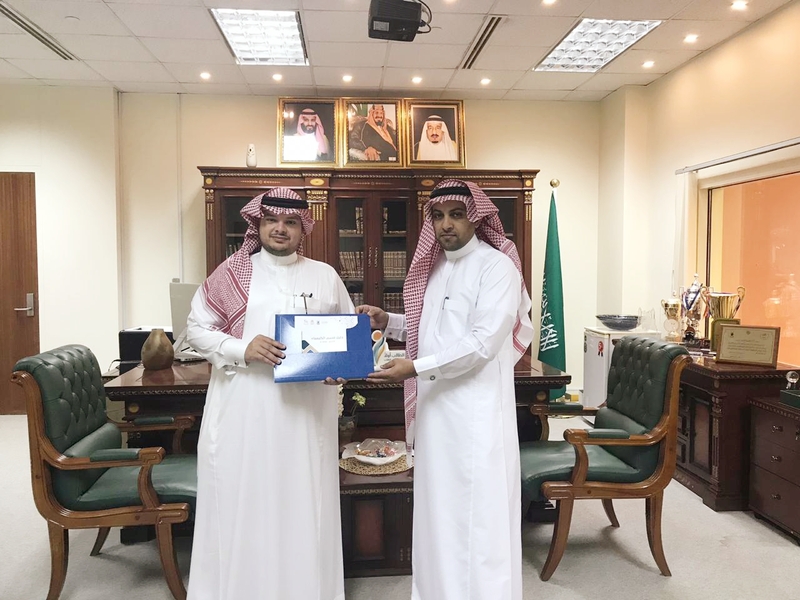 The Dean of the College of Applied Sciences, Dr. Hatim bin Muhammad Al-Tas, has received the Department of Chemistry's guide, in his office at the University's Campus in Al-Abdiyyah, while receiving the Head of the Department of Chemistry, Dr. Isma`il bin Ibrahim Al-Thaqafi. Dr. Hatim Al-Tas appreciated the support and attention given by His Excellency the University Director, Prof. Abdullah bin Omar Bafail, to everything that serves the educational process, including the guides and procedures, aiming to provide all the means that prepare the university environment to embrace the university's staff and be attractive for them. He stressed that this guide comes as a step in clarifying all the procedures and information needed by the students, academic staff, and the department's visitors. His Excellency Dr. Hatim Al-Tas reviewed the Department of Chemistry's guide that included the vision and the mission of the department, the number of the academic staff, the academic plans for both stages of undergraduate and postgraduate studies, a brief about the summer training program and information regarding the rights and duties of the students, in addition to the registration procedures. His Excellency Dr. Isma`il Al-Thaqafi pointed out that the guide will be available in an electronic version on the department's website, to make it easy for the students and visitors of the department's website to read and benefit from the information contained in it. The Dean of the College of Applied Sciences praised the great efforts and achievements attained by the Department of Chemistry, on all levels, wishing success to all the academic staff of the department, and appreciating their attention and ongoing keenness to secure the students' interest in the college and university.